China’s foreign ministry spokesman Hong Lei. (TibetanReview.net, Oct17, 2014) – China on Oct 15 cautioned India against its plan to build a 1,800-km road along the McMahon Line bordering occupied Tibet in the state of Arunachal Pradesh, suggesting this will complicate the situation further. However, India’s Home Minister, Mr Rajnath Singh Oct 16 shrugged it off by saying no one can give warning to India. 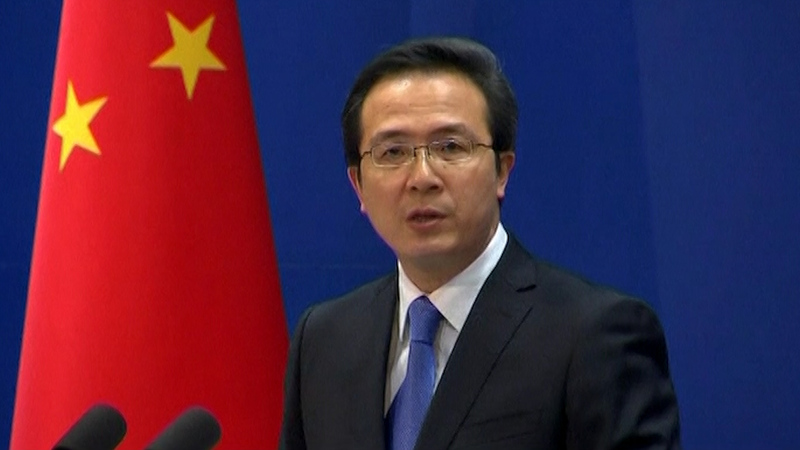 “Before the border problem is solved, we hope the Indian side will not take any action that could further complicate the relevant issue, so as to preserve the current situation of peace and stability in the border area,” Reuters Oct 15 quoted China’s foreign ministry spokesman Hong Lei as saying when asked about India’s plan. “We should jointly safeguard the peace and tranquillity of the border area and create favourable conditions for the final settlement of the border issue,” timesofindia.indiatimes.com Oct 15 further quoted Hong as saying. However, noting that India is now “a very powerful country,” India’s Home Minister has suggested that the two sides should sit together to resolve the border dispute, reported PTI news agency Sep 16. India has recently been trying to take urgent measures to develop its border region with occupied Tibet, given the high level of Chinese infrastructure development on the Tibetan side. In September, it eased curbs on building roads and military facilities within 100 km (62 miles) of the contested border in remote Arunachal Pradesh, so as to hasten construction of some 6,000 km (3,730 miles) of roads, noted the timesofindia.indiatimes.com report. The report cited a senior official in the Indian home ministry’s border management department as saying the ministry was seeking cabinet approval for the road in Arunachal Pradesh, that it already had preliminary support from the Prime Minister’s office. The report said the currently proposed road could be about 2,000 km (1,240 miles) long, running parallel along the Mcmahon Line from Mago-Thingbu in Tawang to Vijaynagar in Changlang district. The plan for this road was made public by India’s junior minister for Home Affairs Mr Kiren Rijiju who belongs to the state. India’s urgency to develop its border infrastructure arises out of the extensive road, rail, and air network developed by China in occupied Tibet which could play pivotal in moving the troops and equipment at a greater speed in the rugged Himalayan region, the report noted. China has recently taken to describe Arunachal Pradesh as southern Tibet to strengthen its claim and does not accept the McMahon line drawn in 1914 at Shimla during a conference between plenipotentiaries of Britain, Tibet and China. China initialed the agreement but eventually did not sign or ratify it mainly due to its grouse over the border between a proposed Outer and Inner Tibet. In 1954, India and China signed a 10-year border trade agreement – the so-called Panchsheel Agreement — with the former, accepting Tibet as a region of the latter and giving up to it all the rights and privileges in Tibet it had inherited from Great Britain.